Rep. Jared Golden of Maine's 2nd Congressional District. Newly elected U.S. Rep. Jared Golden will soon have a presence in the Bangor area: His staff expects to open a district office on the first floor of 6 State St. in downtown Bangor next month. A spokesman for Golden said Wednesday that the Democratic congressman’s office recently signed a lease for the office space and that staff hope to open it by February. “The middle of next month is a safe bet,” spokesman Nick Zeller said. Having an office in downtown Bangor will mark a departure from Golden’s predecessor, former U.S. Rep. Bruce Poliquin, who began his two-term tenure in Congress with an office on the first floor of 6 State St. But two years ago, Poliquin angered some constituents when he relocated the office to a space at 4 Union Plaza, near the Bangor waterfront, that was less physically accessible. The office suite’s location forced visitors to walk up a small set of stairs, prompting accusations that the office didn’t comply with accessibility standards set by the Americans with Disabilities Act, a claim Poliquin’s staff disputed. At the time, Poliquin’s staff responded that they would meet with constituents at other locations if they couldn’t reach the office. 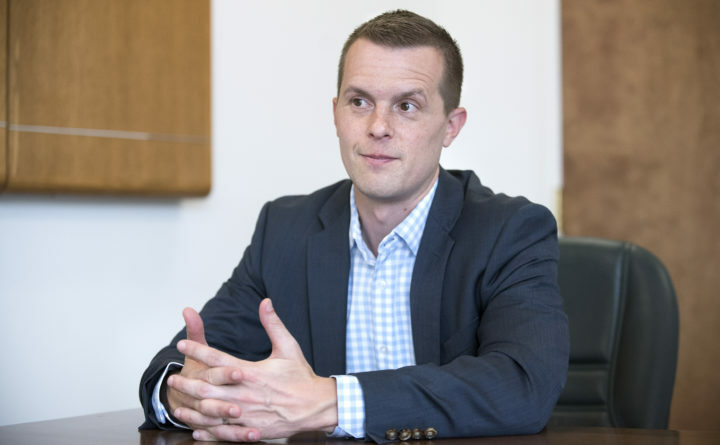 Golden said that before the Bangor office opens, staff in his Lewiston, Caribou and Washington, D.C., offices are able to help.